Uniform x2 LED bulb. 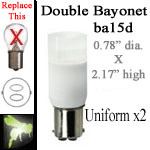 Ba15d double bayonet base connected to a tower style containment to distribute light evenly to every side of the ba15d base light bulb. This LED is able to function on an input of 10-30 volts DC.